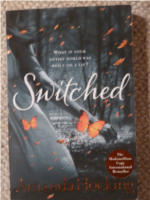 Switched is about a girl namend Wendy Everly, 17 years old, who lives with her brother Matt and her aunt Maggie because her mother tried to kill her when she was six, accusing her of being a changling, a child switched at birth for another one. They move around a lot because Wendy gets expelled from schools often. She figured out that she can somehow persuade people into doing what she wants them to do, but she doesn't want to believe it. In her latest school, she notices a kid called Finn Holmes always staring at her in a creepy way and one night he's even standing in front of her bedroom window, trying to talk to her. Reluctantly, she lets him in and he tries to convince her to go with him. He explains that Wendy is a troll, of the Trylle clan to be exact, that she really is a changeling (as her 'mother' had suspected), that he is a tracker who usually takes the changelings home of the Trylle when they are 20 but because Wendy's power of persuation already being so strong she is supposed to go with Finn right away. She says no and wants to stay with her brother and aunt because it would be unfair to them - leaving them after all they're doing for them. Finn reluctantly accepts that and leaves her. At the beginning I really didn't like Wendy. The first chapter describes the day where Wendy's mum tried to kill her and Wendy acted really obnoxious there; when the storyline is talking about the present, she is a little more acceptable and you start rooting for her. I think that the first negative feelings that you have towards Wendy are intended by the author, as the book's written in first person and it even says "I was acting my usual bratty self". Now I really enjoy the storyline of this book and I can't wait to read the other books of this series. Though I was kind of appaled at first because of the "turn monsters in good creatures that you can fall in love with" theme - trolls, that reminded me of the fact that after Twilight many other creatures were turned into something like-able, I've even heard about a book where Zombies were like Twilight's vampires. But I am positively surprised by the fact that trolls are pretty much just humans, only that they have a deeper connection with the earth if that makes sense. I can recommend this book to all you fantasy-lovers out there, the read is really worthwhile!